If you’re new to radio, it can be hard to know every single piece of gear and understand how it fits into the air-chain. Here’s a catalog of every piece of equipment you might find in a typical radio station. This comprehensive list should be useful to new engineers, or IT guys starting to work in a broadcast environment. If you think of something missing from this list, please post it in the comments below. At the heart of any studio is the audio console (sometimes called a radio panel, sound panel, or sound desk). This is the interface the radio announcer (or panel operator) uses to control what’s heard on air. Every channel represents one “input”. The fader (slider) attenuates or amplifies the incoming signal. 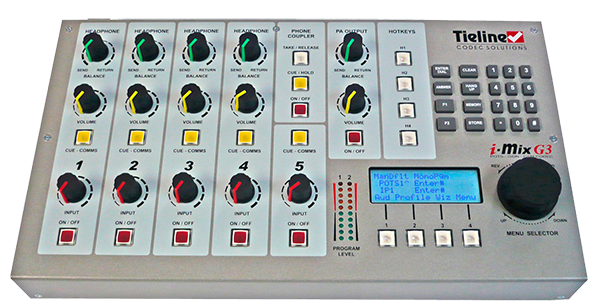 Radio Audio Consoles are very different from a regular PA or Live Sound audio console, and are often more expensive than PA audio consoles as they are purpose-built for on-air talent ease of use. When you turn a microphone on or off, a radio console will mute any speakers and illuminate an “on air” light. When you turn a CD Player, Phone or Computer channel on, often it will “trigger” that input so it starts playing immediately. While analog audio consoles have the physical audio flow directly through the console’s circuitry, many radio stations now use Digital Audio Consoles – these are actually a remote control for a Mix Engine (often located in the rack room). A microphone captures sounds from the studio and turn it into electrical impulses. Broadcast microphones are designed a little differently to PA microphones, as issues such as feedback (the squealing sound that can come through speakers) isn’t an issue in a studio. Experienced audio announcers will often have a favourite microphone. Common microphones include ElectroVoie RE20, Sennheiser MD421, and Rode Broadcaster. 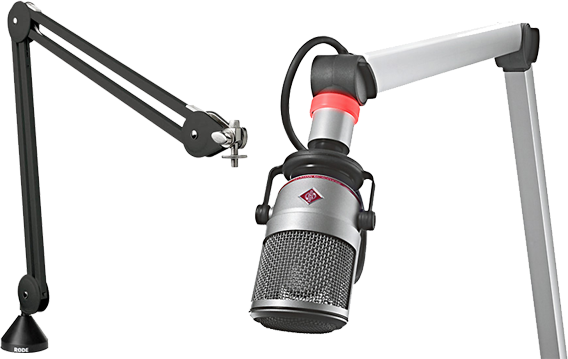 Studio microphones are often mounted on a special arm that keeps the microphone at the correct height. These arms often extend over the audio console, computer monitors, and other equipment – leaving plenty of table space free for equipment and paper. The computer system that plays back music, spots (ads, promos, etc.) and sweepers (the little voice-overs played between songs) is called a Playout System or Automation Software. These are specially designed computer programs that allow for continuous playback of audio, with a lot of granular control for Announcers and Programme Directors. At the heart of any Automation System is the “log”. This is a sequential list of all audio files and commands that need to be played at certain times. All music played on a commercial radio station will be pre-programmed by the Music Director and loaded into the log. A separate person will often load all advertisements into the same log. Most automation systems also contain a music database, hot keys (to play ad-hoc audio), an audio editor, segue editor (to change the mix between different elements), interfaces for website and RDS data, and a lot more. To ensure output of a station is somewhat consistent, radio studios contain different Level Meters. These allow the announcer or panel operator to see if their audio is too loud or too quiet at any given time. Often, you’ll have multiple meters showing the levels at different points in the signal chain. Some radio stations also provide phase meters along side level meters. This helps you detect mono content, and spot any problems in source material that are likely to cause issues with the stereo image. Studio Monitor Speakers provide an easy way to hear what’s going to air without headphones. 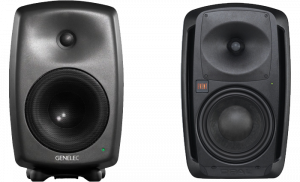 Often, these are very high quality speakers so any abnormalities in sound quality can be detected. A separate speaker is often provided for the announcer hear all audio that isn’t going to air, such as the preview output from your audio console or the feed from your audio editor. By having a separate speaker for this, announcers can be sure their “preview” audio isn’t going to air. 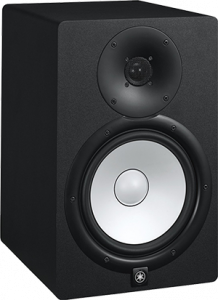 Studio Monitor Speakers are automatically muted whenever a microphone is turned on. As a result, anyone in a studio needs headphones to hear what is going to air. 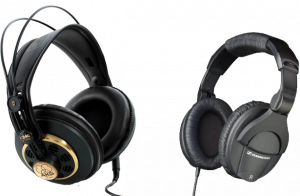 Headphone selection is often a very personal decision based on your preferences in comfort and frequency response. While the main announcer or panel operator can control everything via the audio console, guests often need their own individual control for headphone levels, a cough mute and mic on/off. These panels are generally mounted in front of each guest microphone, usually recessed into the table. Most panels include a headphone jack, and some also contain an XLR connector for the microphone. How do you know a mic in the studio is live? There’s a light especially for that! This light is automatically turned on/off by the audio console whenever a microphone channel is turned on. Usually you’d have at least one light inside the studio, and one outside. Sometimes you need to control settings not available from the audio console itself. This is why many consoles can have at least one row of configurable buttons. These can be physically wired to other equipment (in analog audio consoles), or configured via software (in digital audio consoles). 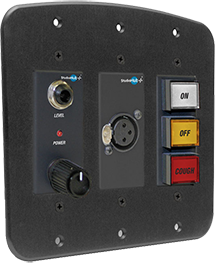 These buttons will often control studio delegation (which studio goes to air), phone systems, automation systems, or even remote triggering for networked radio stations. P.S. GPIO stands for General Purpose Input/Output. If you want to take a lot of calls on air, you’re going to need a Phone Talkback/Talkshow System. 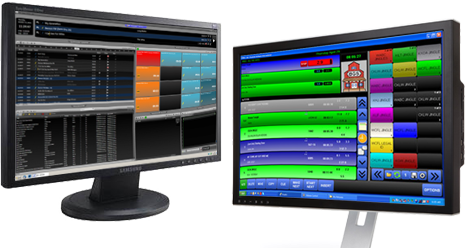 This is a software program or physical controller that shows you every call coming in on each line, and allows you to send this caller to a specific studio or audio channel. Most systems allow you to track callers (a phone book with history), chat between the studio and producers and “conference” multiple callers together. The talkback system often doesn’t connect directly to a phone system, but instead interfaces to a PABX and/or Phone Hybrid. How do you communicate easily between studios? An intercom system. 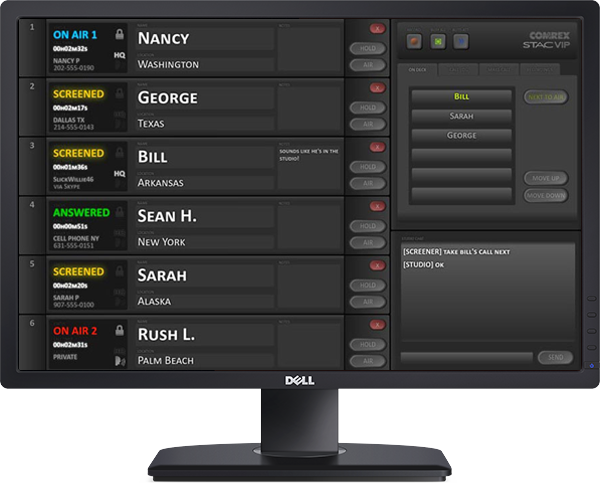 Sometimes an audio console will have a built-in talkback system, and other times it’ll be built into the phone system. While most pre-recorded audio these days is played off a computer, it’s not uncommon to find these playback devices in a studio (even just as a backup, or a way to capture old archival material). Playback of these devices is usually triggered directly from a button on the audio console. Some radio stations use a dedicated microphone audio processor for each microphone. This keeps the levels consistent, and helps tailor the sound. The Rack Room (also: Equipment Room, Master Control, Data Centre, etc.) is my favourite room in a radio station. This is where most equipment lives. It’s an exciting place. 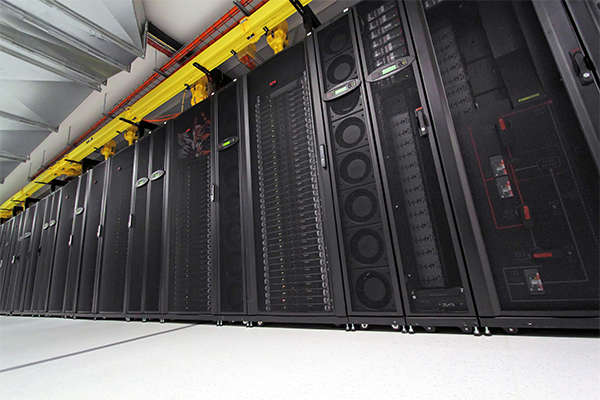 Computers in a rack room will often be in rack-mounted server form factor, even for studios workstations. 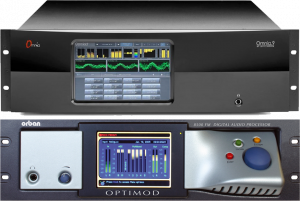 Due to heat and noise requirements in studios, it’s preferable to keep all studio computers physically located in the rack room and simply extend their control with KVM Extenders. Dual power supplies, dual NICs, and RAID’ed hard drives are also sought after to reduce downtime. 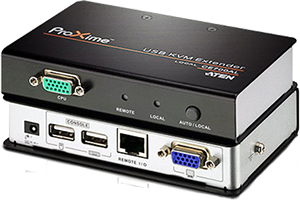 A KVM (Keyboard/Video/Mouse) Extender allows remote access and control of a computer’s keyboard, mouse and video output. This is typically achieved by a pair of proprietary boxes communicating over a dedicated un-switched Cat6 cable. 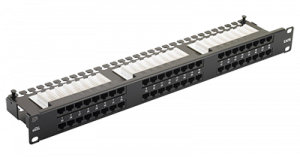 Sometimes you also see IP-enabled KVM Extenders, which are compatible with network switches and routers. If you have a digital audio console, you’ll need something to actually “mix” and process the audio. These days, a Mix Engine usually has two plugs: network and power. As the digital controls protocols are proprietary, you almost always need to purchase your Mix Engine from the same company that makes your Audio Console. Older facilities are likely to have an Audio Router (different from a Network Router). This expensive box receives all audio inputs from your entire facility, and switches them to the correct outputs. The advantage of having a router at the heart of your facility is that you can send any audio source, to any destination, at any time. Some routers are card-based, and allow you to mix and match formats (Analog, AES, etc.). These days, Audio Routers are being replaced in favour of IP-Audio Networks. If you have a digital audio network (such as AES67, Livewire, Dante, or Wheatnet), you need some way to turn analog or AES signals into IP packets and then back again. An “I/O Node” (Input/Output Node) fulfils this function. Most nodes have a number of inputs and outputs, with a web-based configuration interface allowing you to configure the routing. 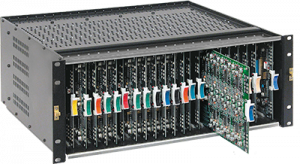 Many Audio I/O Nodes need high-density and widely available connectors. StudioHub is a wiring standard to connect analog and AES audio over RJ45 (network) connectors. StudioHub doesn’t digitise or packetise the audio, it merely changes the connector. A huge advantage of StudioHub is that you can run analog audio over regular network cable, using ordinary network patch bays. With so much broadcast equipment network-enabled, and much more using StudioHub, you can basically connect everything via network patch bays and Cat6 cable. 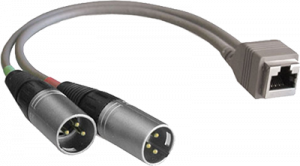 Older facilities use a lot of Multipair Audio Cable, from cable giants such as Belden. This will be terminated to punch-down blocks in every room and rack. Sometimes it’s also soldered into a D-connector, to interface with equipment. A Punch-down Block is a style of cable termination device, where wires are “punched down” (connected) into individual slots. 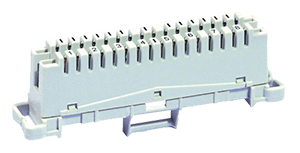 This form of Insulation Displacement Connector (IDC) is common in telecommunications, but it’s also found a lot in older broadcast facilities. Krone is a popular punch-down brand in Australia. Most facilities will still have them somewhere. All audio and control signalling can be punched down to a Krone block and then interconnected with special patch wire (loosely wound pairs of copper cable). For IDC to work, you generally need solid core cable rather than stranded cable. Network cable can also be terminated to Punch-Down Blocks, so it’s not uncommon to see Krone still used for GPIO logic. It’s actually quite a convenient way of connecting logic paths. If you have computers or any digital audio equipment, you’ll need a network switch to allow everything to communicate correctly. Commodity network switches from HP or Cisco are fine, although you generally need a managed switch to configure Quality of Service (QoS), Virtual LANs (VLANs) and Multicasting. If you have a digital audio network, check with your equipment vendor to ensure your switch will be compatible. Any time you need to route IP packets across subnets, you need a router. Due to radio’s heavy reliance on the internet, often core routers are setup in a N+1 redundant configuration. If you have a IP Audio network, you may wish to use a multicast-enabled router, although most vendors recommend against multicast routing for IP Audio as it adds a lot of complexity to the setup. The Audio Processor is usually the last piece of equipment used before your audio is transmitted. Broadcast audio processors contain speciality multi band compressor/limiters, but also have a lot of “magic” features to give your station that competitive edge. Most stations want to be the loudest, and the big Audio Processor manufacturers all claim to be the loudest and clearest. While traditionally you’d have a dedicated box for processing, some vendors are now selling software-based processors. If you’re on a budget, check out StereoTool. If you have a lot of money to spend and want a dedicated box, look at Orban and Omnia. 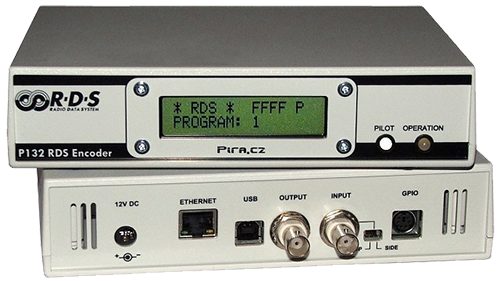 RDS (Radio Data System) is a way of sending ASCII text and other metadata to compatible radio receivers. It encodes a 1187.5Bps data stream onto the 57Khz subcarrier (third harmonic of the 19Khz FM Stereo Pilot signal). Stations use RDS to encode the station name, song data, program guide and traffic information. RDS Encoders are sometimes built into your FM Audio Processor. If you have an external RDS Encoder, it needs to be connected into the SCA input on your Stereo Generator or Processor. If you want to take phone calls on-air, you need a Phone Hybrid. 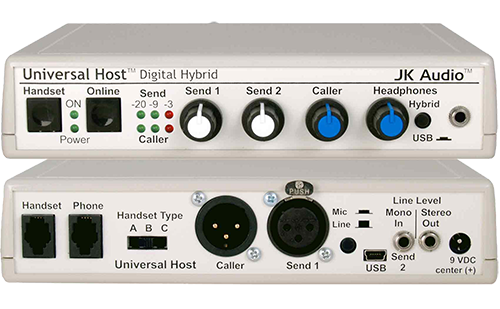 In simple terms, a Hybrid is an interface to connect two-wire phone lines into input and output XLRs. These XLR connectors are plugged into an audio console or I/O node. Many hybrids also contain echo cancellation and an automatic equaliser. Hybrids often connect to a Talkback system and PABX, for easy control by announcers. A PABX (Private Automatic Branch Exchange) is an in-house phone system, found in most company offices. There is nothing special about a radio station’s PABX, except perhaps Talkback system compatibility (these rely on vendor-specific APIs). An Off-Air Receiver is a radio locked to your station’s frequency. This receiver is usually connected to a special monitoring bus in each studio, as well as dead-air monitors/alarms, allowing everyone to monitor the signal as listeners hear it. A Modulation Monitor (or FM Analyser) is a special radio receiver designed for engineers to monitor specific transmission characteristics. This includes modulation power, pilot tone, phase, frequency deviation, signal strength, RDS, and more. Anyone working with FM transmission should have one of these to ensure your FM signal is not only operating within it’s legal requirements, but also at optimal quality. To ensure accurate time-keeping, you may wish to use a GPS-locked clock system. The master unit connects to a GPS antenna on your roof, and then distributes time code to all compatible clocks in the facility. Some stations now opt for NTP-enabled clocks. I’ve even seen Android tablets mounted on studio walls, with a dedicated clock app running 24/7! A nifty solution for the budget conscious! Most broadcast equipment comes mounted in a 19″ case. This is compatible with standard server racks. Deep racks with cable management rails and in-built PDU’s (power distribution unit) can help keep racks tidy. Please be aware that most broadcast equipment doesn’t follow standard computer server cooling conventions. With servers, air flows front to back using special vents and plastic air guides within the equipment. With most broadcast gear I’ve seen, there are no front air inlets. Thus, server racks with in-built cooling may not be suitable. 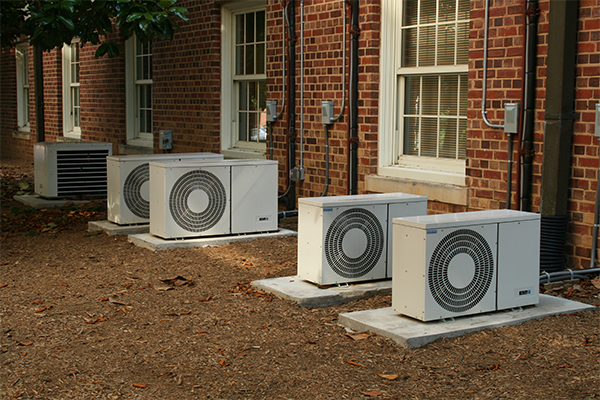 The whole piece of equipment needs to be cooled, rather than forcing air in through the front. Speciality Audio Codecs allow you to transport audio between locations. They are often bi-directional, low-latency, and incorporate lossy encoding algorithms. These are used for outside broadcasts (‘remote broadcasts’ for our North American friends), networked radio shows and transmitter site links. Satellite is a common delivery method for one-to-many audio distribution. If you take networked content from a big provider, it’s likely you’ll have satellite as an option. For example, in Australia the Community Radio Network is distributed via the VAST satellite network (Optus C1 & D3) and Macquarie Radio Syndication is distributed on Optus D2. If you transmit on DAB+, DRM, or HD Radio then you’ll need an encoder. These devices take your analog (or AES) audio and wrap it up in the correct transport protocol ready to be pulled into the multiplexer. Usually you’d purchase an encoder from the big technology companies that develop these Digital Radio technologies, although now some of these technologies can be encoded using open source software. If you have a predominantly analog facility, perhaps without a central router, you may need a audio patch bay to interconnect and re-route audio. When all else fails, you need a device to detect the silence (“dead air”) and trigger some backup content. Many silence detectors have a built-in audio player than can play off mediums such as Compact Flash Cards. This medium is popular because it’s durable and easily re-writeable via a computer. Delegation Switchers provide a way to switch between studios and other audio sources, selecting what goes to air. If you have a router or IP-Audio network, you’ll probably be able to use switching logic within the router or network. Otherwise, you can use an external switcher. Profanity Delays (or “7 Second Delays”) are used to stop inappropriate content from going to air. They work by delaying the content, and providing a “Dump” button to delete the audio currently in the buffer. Some delay units will then fill this time with a pre-recorded ID, but high-end units will stretch the incoming audio so there is no break in program. The Profanity Delay can be located in a studio (controlled directly), or in a rack room (controlled via remote control). If you have multiple studios, it makes sense to locate it in the central rack room. A Studio/Transmitter Link connects your studios with the transmitter site, ensuring audio is reliably sent to the TX site. Analog links (perhaps in the 850Mhz or 950Mhz bands) are popular. 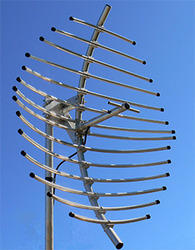 These RF links need line-of-sight antennas and licensed frequencies in order to operate. These days, IP Links (such as unlicensed 5Ghz links from Ubiquiti) are being used to complement or replace the traditional analog STL links. Some stations also use Audio Codecs over the Public Internet, or perhaps a private WAN. Typically a station would have multiple links in different formats to ensure there is never a break in transmission. A FM Stereo Generator takes a stereo audio signal, and converts it into the FM Baseband format. This contains the L+R (Mono), L-R, and 19Khz Stereo Pilot Tone. A Stereo Generator will have a BNC output, which can be connected directly into your Exciter. Often the Stereo Generation will be done in the Audio Processor, and sometimes in smaller FM transmitters it can also be done directly in the transmitter. A Composite Switcher allows you to switch between multiple Stereo generators. 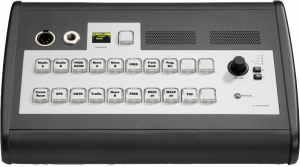 It’s essentially a BNC switcher, sometimes with built-in silence detection or remote control. The FM Exciter takes the FM Stereo Baseband signal (from your Stereo Generator, perhaps via the Composite Switcher), modulates it on your licensed frequency. 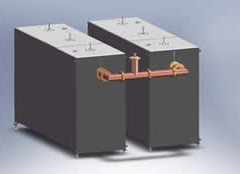 FM Exciters generally output a few Watts of power, and can be used without a separate Power Amp on low power stations. The FM Power Amplifier (PA) takes the signal from the FM Exciter and amplifies it to your licensed power. These days, FM Power Amplifiers are usually built into the Exciter. However, it’s important to note the difference in function even if they do live in the same box. 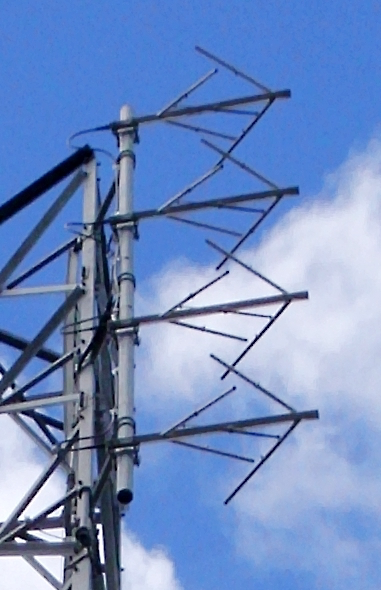 If you have multiple FM Stations sharing one antenna array, you need an Antenna Combiner. This takes the high-power output from every station’s FM Power Amplifier and merges it together so it can connect into the one FM antenna array. They typically contain filters to ensure each transmitter isn’t spewing out RF outside of it’s expected frequency range. FM can be transmitted with just one antenna, but this isn’t always optimal. By adding more antennas to the FM system you’re actually adding additional gain. This means more power without buying a bigger transmitter (sort of). For example, a 3dB gain means the EIRP (actual measured output) is double what you TX PA can output by itself. There’s a lot more to it than this, but remember that extra antennas means more efficient transmission. If you have multiple antenna systems (perhaps for redundancy), you’ll need a way to switch between antennas. To prevent damage to your equipment, antenna switchers have interlocks with the input transmitters. Generally the power output is muted while the switch takes place. In the good ol’ days, transmitters were monitored by real humans with readings taken around the clock. Regulations have been relaxed over the years. A Transmitter Remote Control can be used to monitor all transmission systems and provide alarms if readings are outside their acceptable tolerance. If you’re dealing with high-powered transmission systems, you need to keep the transmission line (coaxial cable up to the antennas) pressurised. This ensures impurities are kept out of the cable. The pressurisation can be done with an air compressor, or a bottle of nitrogen. 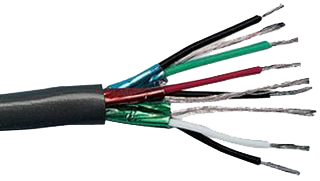 Coaxial cable manufacturers (such as Andrew Helix) have specific recommendations based on the type of cable, power output and environmental factors. This isn’t usually necessary for low power FM stations. An Uninterruptible Power Supply (UPS) provides constant power to all equipment. If you have inconsistent power from the grid, pick an Online UPS – these constantly run power through the battery and inverter ensuring equipment is always protected and power filtered. An offline UPS simply switches to battery power when there is an outage. A UPS can only last so long. To run for extended periods of time during an outage, you need a generator with a decent fuel supply. 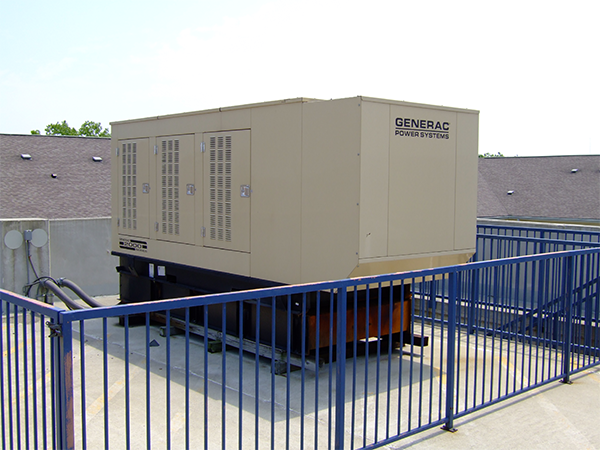 Typically a generator for a broadcast facility is permanently connected with an automatic transfer switch – this allows it to start up automatically when mains power is lost. The generator should be connected to the input of the UPS in the event of a mains failure. This keeps power filtered, and the batteries charged. This will allow allow you to shut down the generator while you refuel (in the event of an extended outage). Equipment needs to be cooled to keep it running smoothly and maximise it’s lifetime. In an equipment room, dual redundant air-conditioners is a must. A network-enabled temperature sensor can help you catch failures quickly. Engineers and announcers both like coffee. 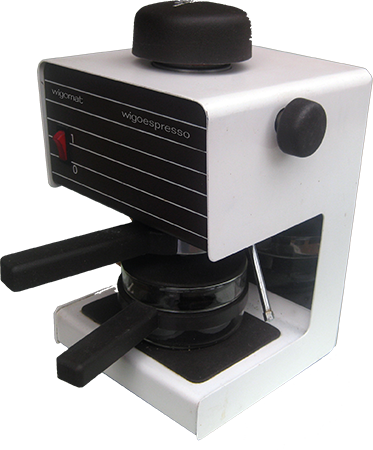 If the coffee machine fails, you’ll probably be the first to hear about it.